For a good part of his career, David Cronenberg has been fascinated by secret societies, be it the New Age-y psychotherapist and his patients in The Brood (1979) or the people addicted to an immersive video game in eXistenZ (1999). With Scanners (1981), he explored a small, but growing number of people endowed with mental abilities that allowed them to read other people’s thoughts or literally blow their minds. This is evident in the film’s most iconic scene where a character blows up another’s head. This premise eerily mirror Brian De Palma’s The Fury (1978), but where it was more a conventional thriller, Scanners incorporated more cerebral ideas as some of Cronenberg’s characters see themselves as the next rung in the evolutionary ladder. Cameron Vale (Lack) leads a vagabond lifestyle and is kidnapped and brought to Dr. Paul Ruth (McGoohan) who works for a mysterious corporation called ConSec. He tells Vale that he is a “scanner”, someone with telepathic abilities and proceeds to teach him how to use his powers. Ruth soon finds himself at odds with Braedon Keller (Dane), head of security at ConSec and who is secretly in cahoots with Darryl Revok (Michael Ironside), the leader of an underground group of scanners. Ruth sends Vale to infiltrate Revok’s group and the film builds to an inevitable confrontation between the two powerful scanners. Stephen Lack, who came from a performance artist background, delivers a wonderfully idiosyncratic performance as Vale, a man who is initially uncomfortable in his own skin, but gradually becomes more confident as he learns how to control his abilities. In one of his career-defining roles, Michael Ironside is excellent as the malevolent Revok who sees himself as a Che Guevara-type figure. Lack and Ironside’s contrasting acting styles compliment their adversarial characters nicely. 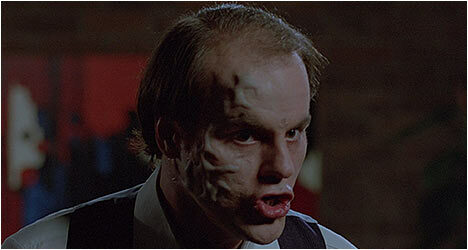 Scanners was part of a fantastic run of early films that Cronenberg wrote and directed himself as he explored the dark intersection where the science fiction and horror genres converged. The success of this film spawned two lackluster sequels that Cronenberg wisely had no involvement in. Unlike The Fury, Scanners goes into much more detail about how these mental abilities work and how they can be harnessed as evident in a scene where Ruth teaches Vale how to accelerate a man’s heart beat, almost killing him. Cronenberg goes further than simply pitting good scanners vs. bad, but also touching upon the notion that they maybe the next step in human evolution. This Blu-Ray transfer was supervised by Cronenberg himself and sports subdued colors with rich earth tones. In keeping with other Criterion transfers, this one preserves the texture of film stock in a very pleasing way. There is a trailer and also a few radio spots promoting the film. “The Scanners Way” takes a retrospective look at the film’s impressive special effects with interviews with director of photography Mark Irwin, special makeup artists Stephen Dupuis and Chris Walas and others who talk about working with Cronenberg. They also talk about the production and how he was rewriting the screenplay on a daily basis. The participants recount engaging filming anecdotes and explain how some of the memorable effects were created. “Mental Saboteur” is a fascinating interview with actor Michael Ironside who talks about how he got involved with Scanners and what it was like working with not just Cronenberg, but also some of his co-stars. The veteran actor also touches upon his time as a struggling actor in Canada in this engrossing extra. “The Ephemerol Diaries” is an interview with actor Stephen Lack. He got his start as a performance artist in Montreal and had no traditional training as an actor. He candidly recounts the breakneck pace of the production and the problems Patrick McGoohan had understanding the material. Also included is an excerpt from an episode of “The Bob McLean Show,” which aired on the CBC in Canada. Cronenberg is interviewed about Scanners with clips shown from his earlier films as well. Finally, for Cronenberg fans his 1969 feature film debut Stereo is included. With its medical experiments and telepathy, it anticipated Scanners.